Surviving the Death Zone - The Broken Axe - But Who's To Blame? The Broken Axe - But Who's To Blame? One and a half Black Diamond Vipers. It's worth noting the presence of an upper and lower pommel. These curved pieces of black reinforced plastic protect the fingers from direct contact with ice or rock following a swing of the axe. The upper pommel can also be used to help climbers hold the axe higher up the shaft. "I am writing this post to inform friends and clients about the risk of Black Diamond (BD) ice climbing axe failure. Last winter (2017) whilst climbing a grade V ice route in Scotland on Hell's Lum, my axe shaft snapped. I was just climbing the easy pitch to the top and daggering with my axes. One of the handles snapped clean off! The point of failure was at the rest where the shaft is drilled. I work as a professional Mountain Instructor and look after my equipment. If the shaft had snapped about 1 hour earlier I could have taken a large fall. So here are the details. The axes are bronze Vipers, they were manufactured in 2003 and I think bought in 2006. Used on average about 10 climbing days per year. I've climbed up to grade V 6 with these tools and have not used them for dry tooling. Throughout the winter I use other axes such as mountaineering axes, hence only 10 days on average per year using the vipers. What was BD's response after receiving both axes and testing them? "In conclusion, this failure is no the result of design, material or manufacturing defect. The crack and resulting failure occurred as a result of metal fatigue as a result of frequent/heavy use over a long period of time fare exceeding recommended use." On reading the BD website they only guarantee their axes for 3 years. So am I being crazy expecting an ice climbing shaft to last longer than 3 years? "17.1 Lifespan: this is the maximum life of the product should remain in service ... Metal Products - no time limit." Well, its clearly time to buy a new pair of axes and I for one am glad to be alive. I shall not be buying any BD gear at all and will probably be buying DMM axes." The broken axe. Note the presence of a drilled hole in the shaft. This is the site at which the upper pommel is attached. Whilst this BD Viper has a fixed upper pommel, the most recent version has an adjustable upper pommel and dispenses with the drilled hole. Is this a tacit acknowledgement of a previous design flaw? So on balance who's to blame? "All equipment has a natural lifespan and will eventually need replacing but how long this will be depends upon many factors. The condition of ice axes is very difficult to determine as by their nature they can rapidly look much more used than perhaps they are. Some time ago when I got a new pair of DMM Rebels I remember a lot of nice shiny red paint flaked off after one route - they looked like they'd done several seasons! I've still got them today and they've been amongst the best axes I've owned and I would still trust them. It seems to me that there may be a design flaw in these Black Diamond axes due to the location of the hole which has been drilled. If I had a pair I certainly would think twice now about how I used them, which is not what you want when you're potentially pushing yourself or taking out groups of paying clients! Ultimately if they're outside of the warranty I guess BD have no obligation to replace them but, I hope they take notice of, and follow up on the issue raised, as next time someone may not be as lucky." "This is absolutely terrifying! Thinking of all those times I've literally trusted my life to the pieces of metal between my hands and the mountain! My BD axes (Fusions) have been fantastic, but are in a similar or worse state than those pictured. Severe 'wear and tear' is surely the norm when using something for winter climbing so I would like a little more reassurance from BD that this is not a design fault as suggested by some of the other commentators. And, their opinion as to whether other models could be affected too!" "Has there actually been a premature structural failure? After all, the tools were manufactured in 2003 and purchased new in 2006 and they've been steadily used every season at the rate of about 10 routes per year. According to BD, that exceeds the serviceable lifespan of this model. I'm not a metallurgist so I can't comment on the structure or integrity of the design but in my humble experience BD gear is normally very reliable. 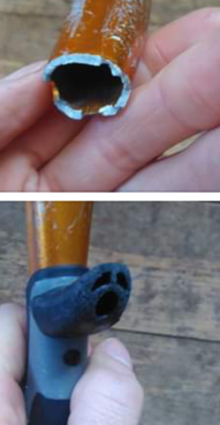 After studying the photos of the offending tool more closely I made an observation - the failed tool looks significantly more used than its partner. Is it older? Or used more frequently? Or hammered repeatedly into the snow to form an ice axe belay? In conclusion, given the number of BD tools being put to heavy use in Scotland every season, this solitary incident should not cause concern." Seems like bad luck but definitely not unheard of. I know an ex-top winter climber (who gave up after the accident!) who did something similar and took a massive whipper and smashed up his jaw years ago, but was aggressively torquing at the time. Its got to be a design fault if only daggering. Realistically, none of us replace our gear strictly on the basis of time, though it has got me thinking whether I should upgrade my 12 year old Quarks!" Clearly, there's two sides to the argument and the debate is likely to run on and on! 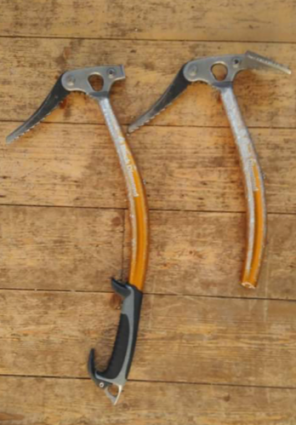 If, as Climb365 suggests, these axes were lightly used and failed whilst daggering up a snow slope, then this would indicate a very worrying equipment failure. It would be reasonable to point towards the drilled hole as a source of weakness and expect BD to accept some degree of responsibility. However, the axes were more than a decade old and showed signs of damage. As Adam says, "severe 'wear and tear' is surely the norm when using something for winter climbing" and therefore it seems unreasonable to expect manufacturers to provide anything more than a short warranty. If we take anything away from this episode it's the fact that climbers need to recognise the extraordinary demands they place on their equipment, replace items on a regular basis and accept the additional cost that this may incur. Many thanks to Tim, Adam, Piers and Jon for contributing to this post.